If you've been holding out for the Kindle 2 for a little lower price you're in luck. 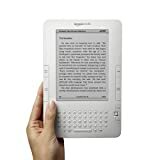 I paid $359 when the Kindle 2 first came out and my biggest negative in the GeekTonic Kindle 2 Review was the high price. Since then the price has dropped twice and is now down to $299 with free shipping! Still expensive, but so much better than before. Also of note, Amazon dropped the "2" changing the name from the Kindle 2 to the Kindle 6". I would imagine that the name change is just to signify that this version of the Kindle is the flagship with the KindleDX being the more specialized version.